As Japan suffers through what likely will become its hottest summer on record, with temperatures in some places topping 40 degrees and humidity at all-time highs, and even as business owners happily celebrate skyrocketing sales of air conditioners, fans, and ice cream [Ja], worries of an energy crisis loom on the horizon. And while the Cool Biz campaign initiated by the Koizumi administration has gone some way to reducing the demand for artificial cooling and dehumidification, active participation in the campaign nationwide remains relatively low [Ja]. Add to this that inventions such as the recently released USB necktie allow salarymen to stay cool and keep their suits on, and the future of energy conservation in Japan looks less than promising. We don't use the air conditioner during the heat wave. Don't use it in the car either. Every day sweating like crazy. Every day I think about the heat, but because my body metabolism picks up energy, my body condition has improved. It's become a kind of diet. We open all the windows in our office. In the morning and evening, we water the plants. And it cools down. If the goya [bitter gourd] tree gets bigger, there will be more shade. Sometimes these sales people come by wearing suits, but then they say: “Wow, it's hot, isn't it?” and leave right away. This is not a service business, so it's fine [that they leave]… The computers also gasp for air [because of the heat], so sometimes we turn them off. Saying it's hot and then putting on the air conditioner — it's only humans that do this. Cicada, dragonflies, frogs, dogs, cats, none of them live with air conditioning. I get going early in the morning, when it's cool. At noon I take a lunch break and have a little nap. I sleep on the hardwood floor. Thanks to the summertime, I lose body fat. And you know, I don't drink beer during the summer, because it makes me sweat even more. 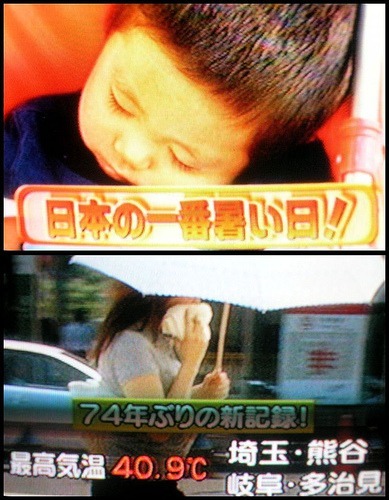 Once the Yosakoi festival and high-school baseball finishes, it will become easier to bear [the heat]. Up until then, the patience contest continues. Even while the world celebrates the Bon holiday, companies go without a vacation. There is no option but to let efficiency drop a little bit in order to withstand this heat. Anyway, people who stay inside their building soaked in air conditioning while talking about environmental problems are nothing but imposters. They should go outside into the scorching heat and then think about it. The leaders should do this. Thank you for translating Kenchan’s post, it’s quite inspiring! I wonder what the effect would be if major cities declared “no work” days for rare extreme events like this day in Japan.